Singer and performer Pink is traveling with her two kids — Willow, 7, and Jameson, 1 — on her "Beautiful Trauma" tour. Easy-peasy? Heh. Nope. But the music icon feels incredibly grateful that her life allows her to have them on the road with her, something she discussed with actor Reese Witherspoon in an episode of Witherspoon's new unscripted TV series, Shine On with Reese. 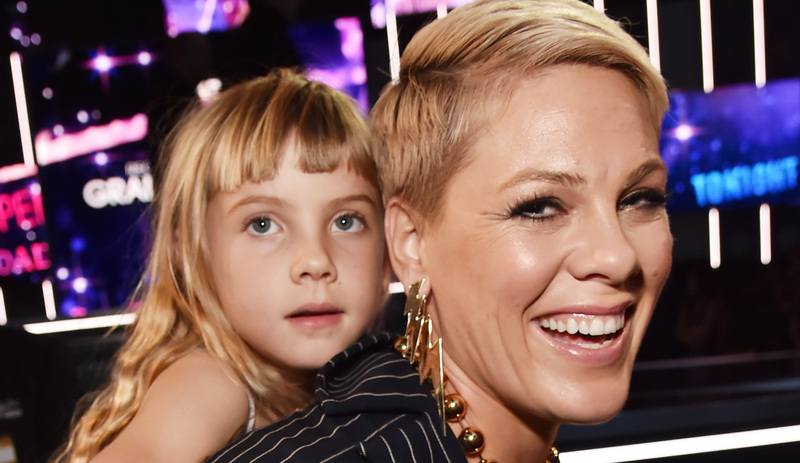 Pink and Reese chatted candidly in Pink's car in traffic (what we wouldn't give for a seat in back) about what it's like to do a tour with kids in tow. Here's a clip. "Going on tour with children is really tricky. It's exhausting," Pink told Witherspoon. "It's the hardest thing I've ever done, but I'm very, very fortunate that I get to bring my kids with me and that I kind of get to integrate them into my life." Pink often shares sweet photos of the whole fam on tour on social media, like this crazy-cute sibling pic. Pink's children are clearly thriving from all the travel. Pink recalled, "I asked [Willow], 'What was your favorite city?' And she said, 'I think it was Berlin.' I said, 'Why?' and she said, 'Because there was a wall, and people were separated, and there was a war. And now everybody's together.'" Honestly, we are dying to know how Witherspoon and Pink hooked up for this mom date. Look at these two buddies (shared by Witherspoon on her Instagram). Also in the episode, Witherspoon revealed that when her daughter, Ava, was 7 years old, she wrote Pink a letter after listening to "Stupid Girls." The famous moms commiserated about a culture that encourages women to fake being stupid for approval — something Pink and Witherspoon definitely cannot be accused of. Pink has spoken frankly about motherhood in the past as well. In October, the star talked to Entertainment Tonight about loathing mom guilt and coping with the challenges of finding balance in her life. "I would love to get rid of some of the mom guilt 'cause that really shades a lot of my decision making. I walk out the door, I leave my heart behind and it is conflicting, it is always conflicting and I want to be the best mom in the world," Pink said. "I put way too much pressure on myself. I don't know, we put that on ourselves, that is how we mom now." Wish we couldn't agree with that — but the culture of mom guilt is almost as rampant as the culture of "stupid girls," and we'd love to see that change.